Since the arrival of rhubarb in June, I’ve been canning and jamming non-stop. Of course that means my larder is steadily accumulating a nice selection of jam. I love jam on toast as much as anyone but using my homemade jam in baking is turning into a fun challenge. Today I baked another recipe from Joanne Chang’s Flour as a follow up to yesterday’s Chunky Lola Cookies. This time, the recipe caught my attention because it conveniently calls for good quality jam as a surprise filling for corn muffin. What a coincidence that I have a small bag of cornmeal from my CSA Kawartha Ecological Growers! Local cornmeal and homemade jam sounds like a match made in heaven to me. My northern palate prefers the lightly sweetened corn muffins over the savoury cornbread of Southern tradition. Corn muffin is a great breakfast treat that straddles between sweet and savoury. At its heart, Chang’s recipe is a classic muffin formula tenderized with melted butter, crème fraiche, buttermilk, and a touch of oil. Brown sugar adds a hint of molasses without being overpowering. The key to flavour is the choice of cornmeal. Every so often, my CSA delivers fun surprises in our share including their own milled flour and cornmeal. I recall vividly the first time I opened a bag of their cornmeal and how the aroma of roasted corn filled my senses. It was unlike any stale supermarket cornmeal I had come to know. As for the flour, I slowly accumulate a small collection as well including hard whole wheat, buckwheat, and spelt. I love the silkiness of spelt flour and the nutty taste. It is a combination of whole wheat flour’s robust flavour and all-purpose flour’s versatility. I used both cornmeal and spelt flour in my version of the muffin. 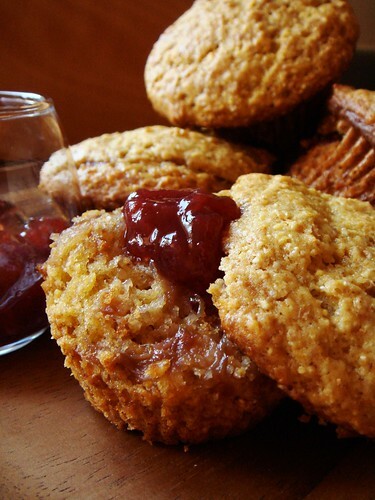 Another contributor of these cornmeal muffin is the surprise jam filling. I used a homemade Rhubarb Raspberry Jam which is the first batch of jam kicking off my 2011 summer preserving season. The recipe is adapted from David Lebovitz’s Rhubarb Strawberry Jam except the raspberries made jam set so much easier with its good amount of natural pectin. 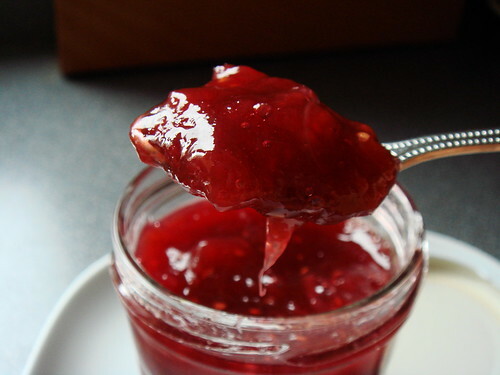 I love the vivid ruby colour of this jam and its tartness is a delicious counterpoint to many sweeter partners. It doesn’t share the same popularity as my Minty Strawberry Jam at home but its smooth texture and soft set made it great companion for the corn muffins. I stayed close to Chang’s recipe with only a few minor adjustments. I appreciate the inclusion of weight measure in this book though I was a little sceptical of the conversion for cornmeal. 1 cup of cornmeal is listed as 200g in the recipe. I started weighing my ingredients and it looked well over a cup when the scale read 150g. I measured again using measuring cup and decided to go with volume amount instead. 1 cup of my cornmeal weighed merely 140g. As for the flour, I used a 2/3 all purpose unbleached and 1/3 spelt. It was not intentional but out of necessity. I couldn’t believe I ran out of all purpose flour! Instead of using whole milk, I used full-fat buttermilk (maslanka) since it was what I had at home. One last thing, I used 2 duck eggs which has the same weight as the 3 large chicken eggs the recipe calls for. The batter was thick as promised. After I divided half the batter among the muffin tins, I dug a small indentation in the batter for the jam filling. This extra step prevents the jam from sliding off to the side of the tin and get caramelized later during baking. I love the domed top of these muffins with its craggy surface created by the coarse cornmeal. The muffins are really tender without being greasy. However, most of the jam filling became one with the muffin instead of remaining a pocket of sweet surprise possibly due to the smaller size of my muffins. I like to serve them with a little container of Rhubarb Raspberry Jam so I am free to pile on more jam. 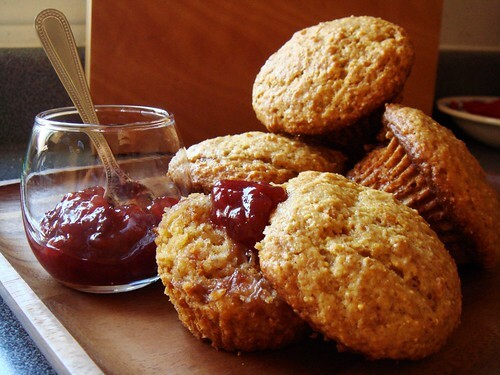 This is certainly a tasty use of my homemade jam and the muffins are great addition to the breakfast table. If you would like to check out more of Chang’s recipes, I highly recommend her cookbook. Leite’s Culinaria is currently giving away a copy of flour: Spectacular Recipes from Boston’s Flour Bakery + Cafe. Enter for your chance to win!